When my eldest son got married recently, he asked me to chose a passage or poem I would like to read during the service. As it was a civil service, the legal requirements stipulated there could be no religious references. I scoured my large collection of books, as well as the internet, but couldn’t find anything I liked that hadn’t already been used several times at other weddings we’ve attended recently. Therefore, I decided to write a bespoke poem for Samuel and his bride and present it in a booklet which matched the wedding stationery I designed and made for them. The poem I wrote can be seen below. I enjoyed the challenge of creating a unique, personal poem for the happy couple and was delighted to receive myriad compliments from their guests. Following this, several people asked me to write them a bespoke poem for a variety of special occasions. Events have included weddings, birthdays, staff leaving and retirement parties. I enjoyed writing these poems so much, and have received such positive feedback, that I have decided to advertise my bespoke poetry writing service more widely. Please get in touch if you would like me to create something unique and special for you. 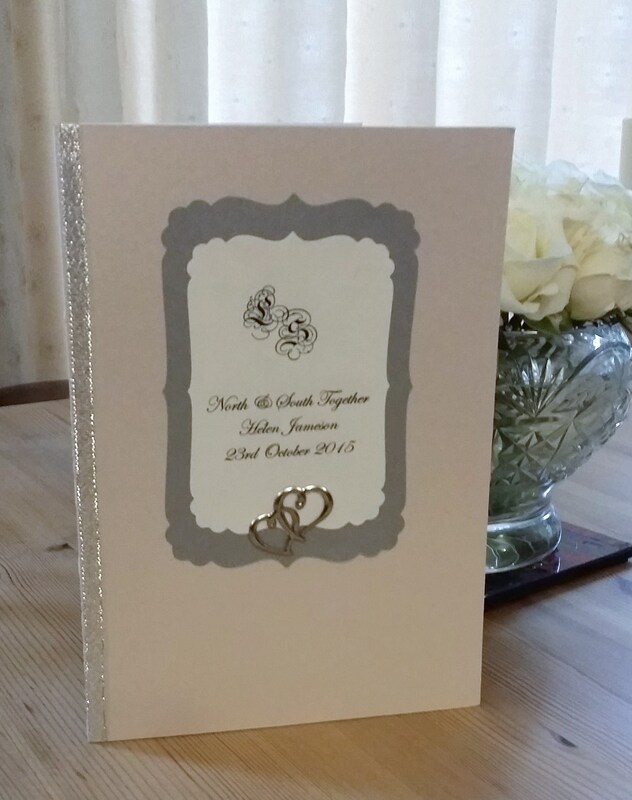 Prices start from just £55 for six, 4 line verses, emailed directly to you. For an additional £6.50 (including P&P) I can also make you an A5 presentation booklet of your poem in colours of your choice. Today we see that’s true. Blond hair contrasts with raven locks. Brown eyes gaze into blue. Spoons stand up in her tea. While she’s just five foot three. He is the strong and silent type. Whilst he’s much more audacious! And, if they can, then how? Taught me what real love is. In a warm, secure, haven. The cornerstone of our building. Yet strong and most protective. Is what marriage should be. Be what you’re thinking of. Has love that never ends. Keep them safe within your heart. ← What is Your Favourite Book for Reading Aloud?